Comments on "On the Street.......Chopped Leather Pants, Paris"
I love the contrast between the harshness of the outfit and the lushness of the trees. The environment determines so much how fashion makes or brakes the character of a city. As always Paris is such a beautiful backdrop. It takes serious commitment to chop your leather pants. I wonder if he did it himself? I couldn't. are those really leather pants? i love how worn they look. this outfit looks so comfortable - i would unbutton the jacket though - and the boots are outstanding. i actually surprised myself and i like this look. good spot sart. 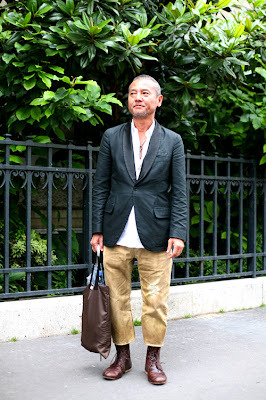 I love the whole upper class vagrant looks that some of the gentlemen you've photographed recently have been sporting. his deails contribute a lot. His necklace and shoes really pull the outfit together. love this - am off to find some leather pants now to chop for myself! Great look. I ssaw a similar jacket (APC) and it was a two button waxed cotton. I wonder who this jacket is from? An interesting look, perhaps for the advanced dressers; very easy to get this one wrong I'd imagine. The only false note (for me, anyway) is how short his legs look due to the proportions of the jacket and pants. The shoes are best in this pic. Otherwise the man looks quite short in his outfit-maybe the shortened pants gives this impression. Brilliant look. I happen to be heading to Paris in the fall. Can anyone recommend some shops--clothing or otherwise--worth visiting? Sorry, but the proportions are woefully off, making the guy look, well, dwarfish. I think that the boots are Pantafolo d'Oro. this is great. i dont see myself in cropped leather trousers...but it certainly inspires the unusual item. this is cool. thanks sart. I'm digging it. I wish the bag wasn't leather. I think a cotton type bag would work well with the shirt. The boots are my favourite part as well. The police in Salvador Brazil wear similar ones. My husband tried to buy a pair off of one while we were there last year! Those shoes reminds me of vintage boxing shoes. And I love the light weight tote satchel type bag that he uses to balance the heavier textures of leather( pants and shoes). Visually satiated my need for chic. Thanks! Love the fit of jacket and the length of pants. i love the jacket and the boots look like the boxing type boots from the f/w 07/08 miu miu collection. Pants make him look younger - mission accomplished! I'm pretty sure the pants aren't leather, but a cotton. They look like "rotten banana" half chinos by the Japanese brand wjk. LOVES IT!! I find it super-inspiring in terms of contrasts. I especially love the shawl lapel on his jacket, and his lovely boots which I think pull the entire outfit together. I love the idea of chopping off the leather pants!! I'm going to do it. With great shoes and small soft jacket it is great. Once again, nothing I would find in Vogue, but way better.